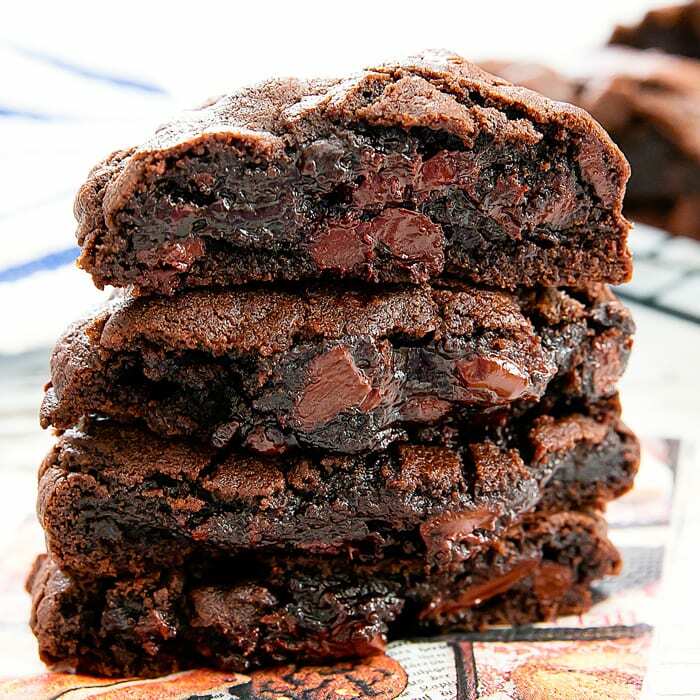 These decadent double chocolate chip cookies are thick, soft, and rich. 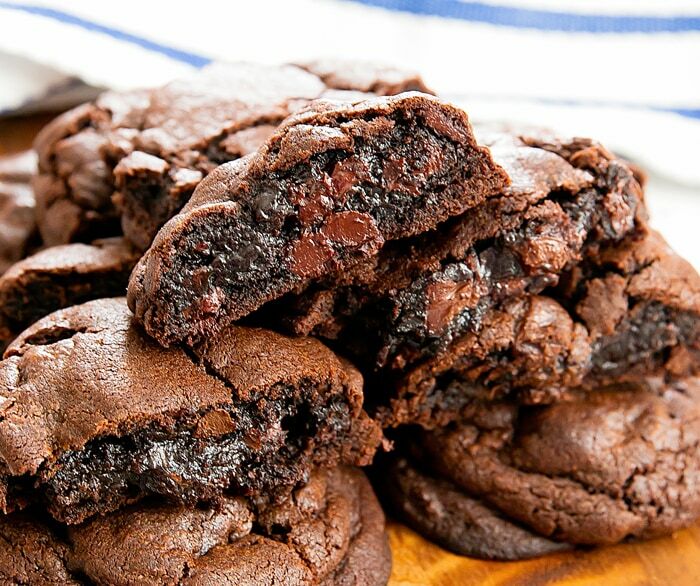 They taste very close to the dark chocolate chocolate chip cookies from Levain Bakery in New York City. As you may recall, I visited NYC a few months ago and tried Levain Bakery’s famous chocolate chip cookies (post here). 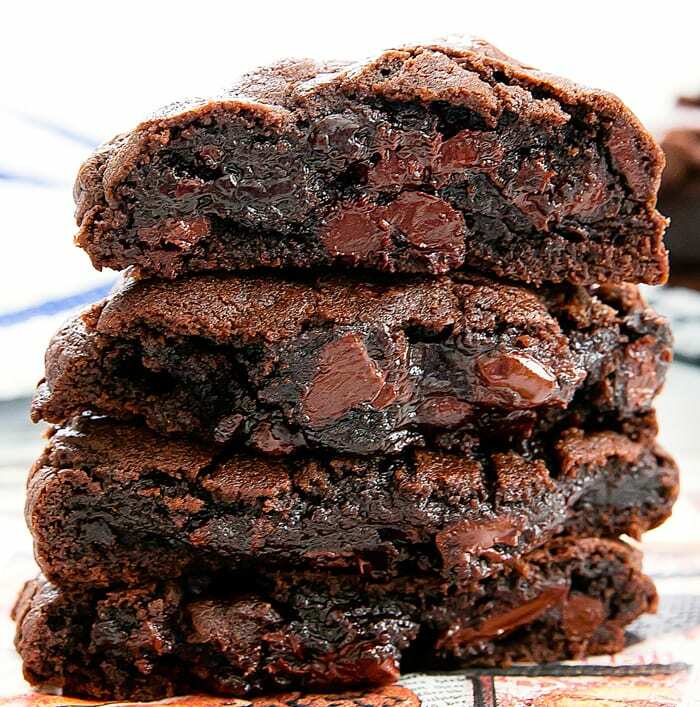 While I loved their signature cookie and could finally understand the hype and long lines, the cookie I most adored was the dark chocolate chocolate chip cookie. It was so rich, decadent, and chocolatey. I immediately knew I had to try to replicate them. While I was eating my Levain Bakery cookies, I was also analyzing every bite, trying to determine why they are so special. I think their appeal is that they taste like regular home baked cookies rather than more cheffy gourmet cookies, and yet they aren’t quite like your typical homemade chocolate chip cookie recipe. They are crisp on the outside and yet very soft in the center. The chips stay gooey and half-melted. They are thick and rich, but have a lightness to the crumb. These suggest they are using a few extra steps beyond the typical recipe to achieve these characteristics. There are many copycat recipes out there. After trying a few, this one is the one I found most promising and incorporated many techniques I suspected when analyzing the cookies. When the cookies are first baked, they are thick, crispy on the outside, with a still-soft center, and a light crumb. They stay so for a few hours, but eventually they did lose the crispy exterior and the crumb became denser. The ones I had from Levain Bakery managed to maintain that just-baked texture almost a full day. So I’m still not quite sure how Levain Bakery does it. But don’t get me wrong. These cookies are delicious. Definitely worth sharing and gifting to chocolate lovers. I’ll be making them for holiday cookie gifting this year! Recipe now updated with video! You can also view all my recipe videos on my youtube channel. Also check out my copycat for the classic Levain Bakery Chocolate Chip Walnut Cookies! In a mixing bowl of a stand mixer, cream together butter and sugars on high speed until light and fluffy (about 3-4 minutes). Add eggs one at a time, mixing well after each addition. Add in cocoa, cake flour, all-purpose flour, cornstarch, baking soda, and salt and set mixer on lowest speed setting to stir until dough is just combined (please note in the video the mixing is sped up to keep the video short). You want the dough to be smooth and uniform in color, but you don't want to overmix it. Stir in chocolate chunks. Place the dough in the fridge for 15 minutes to chill. Line two baking sheets with silicone baking mats. Measure out about 4.3 oz of dough and roll into a ball. Place several chocolate chips on top and adjust chips until the dough weighs 4.5 oz. Place dough ball onto baking sheet. You will place four on each baking sheet, spaced about 2 inches apart. You should have enough dough to make 8 cookies, but it is best to weigh the balls so that they are all the same size and will cook evenly. Bake the cookies for about 10-11 minutes, or until the surface is dry and cookies look almost set. Remove and let cookies cool on the baking sheets (if you try to remove them they will likely break apart). Allow cookies to cool about 15-20 minutes so that they can set. Then remove and enjoy. Check out all my cookie recipes here! Reading your comparison of these cookies vs. Levain’s, I immediately thought cornstarch may be a factor- but you’re already on top of it! Gelatin also comes to mind, it’s used by paleo dieters in their cookies to give them chew. Or maybe they really like sneaking gelatin into recipes. In any case, these look super duper. Thank you! Yes, cornstarch was the first thing I thought of when I was eating the cookies at the bakery! So that was one of the things I was searching for when looking for a copycat recipe to try. Also chilling the dough. If I do come up with an even better recipe, I’ll update this post, but so far this one is really good! I’d love to try and make your recipe but what is cake flour if you aren’t in America? 🙂 what makes it different to normal plain flour? Oh wow! I want to get in the kitchen and start mixing these up. I haven’t had the real thing. One day! You would love Levain Bakery!! I’d prefer to make smaller cookies, Jen. How would you adjust the baking time for 1-2 Tbsp of dough? Thanks! I haven’t experimented with smaller ones, but you would probably want to just keep your eye on them the whole time since they would be done in just a few minutes (maybe 5 minutes?). One thing though- they might stay more ball shaped in smaller portions since this dough is designed to make thick cookies that don’t spread as much. I made average-sized cookies (using a 2 Tbs scoop) and this recipe made exactly 3 dozen. I scooped then chilled them (for half the time) and baked them for 7-8 minutes. 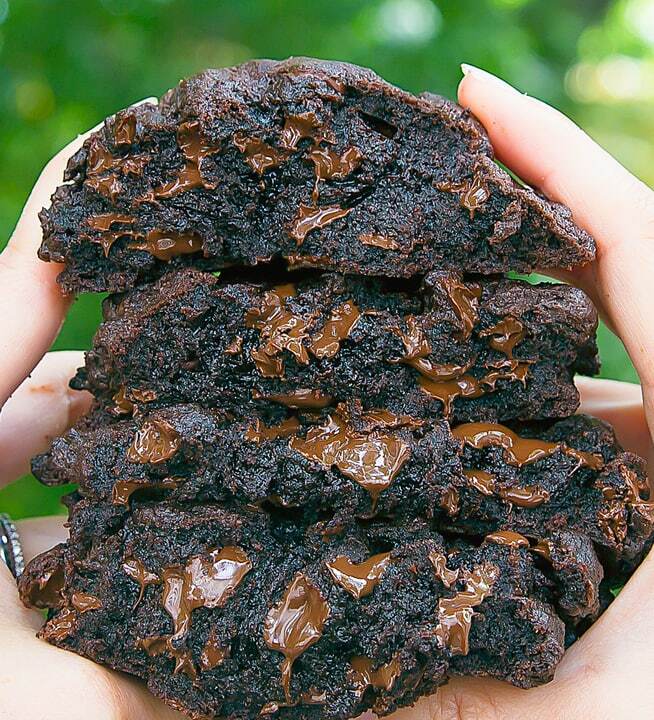 Picture perfect, chocolatey goodness! thank you for sharing your results! I also used 2 tbsp scoop and baked for 6 minutes. I am obsessed with levains cookies! I have been look for the chocolate chip copycat recipe but I haven’t found one, do you have one? Thanks so much for this recipe! I made these tonight as a last decadent treat before starting my diet and they were absolutely amazing! Will be making these again for sure. My family loved them as well, thanks again! I’m so glad you enjoyed these! I plan on making them again in February! These turned out delicious!!! But seems like my batch spread out a bit more than yours. Any idea why they didn’t remain as thick after baking? Hmm I’m not quite sure. I would suggest chilling them for longer and that should keep them from spreading. Made these and sized them at 2.25 ounces since I didn’t want such huge cookies for my kids. They come out wonderfully delicious. I used same bake time and they didn’t look quite as gooey as in the photos, but they were still awesome. Will be working on some tweaks of my own for later publication! Thanks for turning me on to this trend! glad they came out well for you! oh yay! so glad you enjoyed them! These are so delicious! Thank you for sharing your recipe. I made large tablespoon full cookies (about 24 cookies total) and baked them for 7-8 minutes. I placed about 8 cookies on a baking sheet at a time. This recipe will definitely be a go to recipe from now on. so glad you liked it! and I’m glad they worked well as smaller portions! Hi Did you use Dutch processed cocoa? Ridiculous how good they look! Thank you. these looked so delicious in your pictures that i had to make them, but mine turned out more cake like and not so gooey like yours, even though i followed the steps and i baked them for 10 min. Maybe because as it was my first trial, I halved the recipe, and as I didn’t have cake flour and I tried to make one with all purpose flour + cornstarch but I messed up the ratio. Whats the secret to that soft gooeyness?! Hi. You mentioned that you messed up the cornstarch + all purpose flour ratio. That would change the texture of the cookies. It’s fine to halve the recipe, but make sure you have all the measurements right. At 10 minutes, the cookies should still be slightly underbaked inside (assuming you are doing 4.5 oz each), so that is why they are gooey. If your cookies were smaller, they would need less time in the oven. you can do a cake flour substitute. please look online for how to create cake flour using all purpose and cornstarch. but if you do this, make sure you don’t leave out the cornstarch that is already in the recipe as well. Amazing! They were really just like the real deal! I went to NYC last year and thought I’d never try them again! But behold – I had them ?in my very own kitchen! Thanks for sharing the recipe!! I’m so happy you enjoyed these! This is my second time making your recipe and I can say without doubt they are fantastic!!! 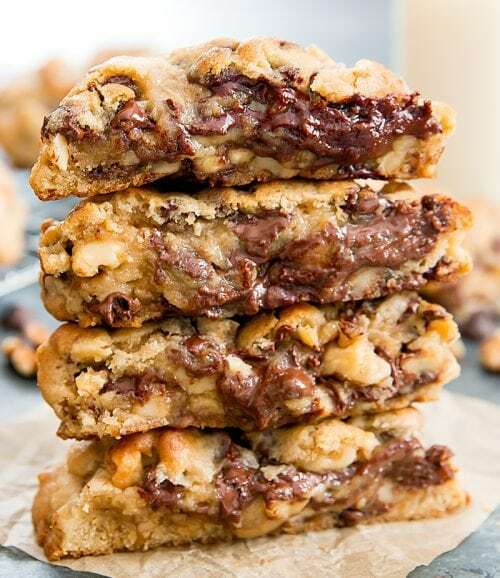 It is my go-to chocolate chip cookie recipe! yay!! so happy to hear that! Do the butter and sugars come together if the butter is still cold? Usually recipes call for room temp butter to mix easier? Can I make these ahead of time and freeze them? Also, though I didn’t have a baking sheet, parchment paper worked pretty well. A very tiny tiny bit burnt at the bottom but not noticeable. I’m glad you enjoyed the cookies. They do set to the right texture once you let them cool. Unfortunately, I do not have the nutritional information for this recipe. There are websites out there that allow you to calculate nutritional information for recipes but since I can’t confirm how accurate they are, I do not provide that information for my recipes as I don’t want to provide any wrong information. Made these for my husband and I and they are absolutely delicious! By sharing this recipe you made our lives just a little bit sweeter…thank you! aww, thank you for the kind words. I’m so happy to hear that you both loved the cookie recipe! Thank’s for the recipe .. Excellent! 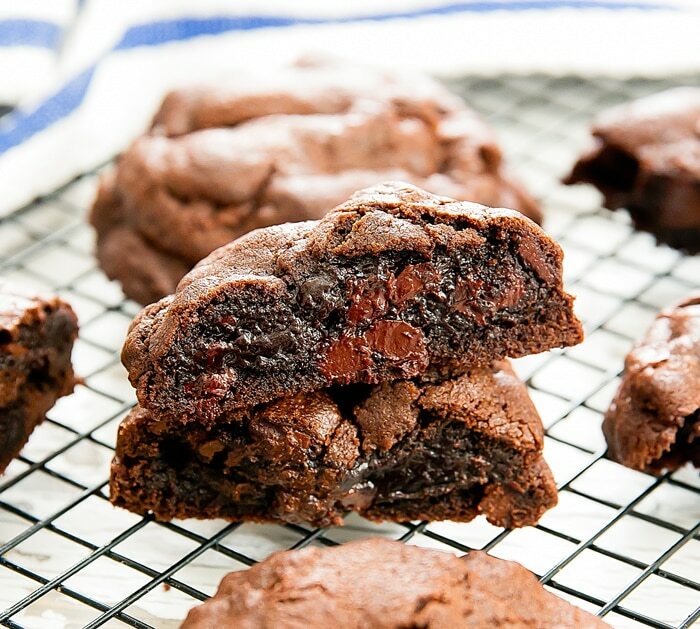 If you are a chocolate lover, these cookies are for you! I made these exactly like the recipe – save for the silicone mats. I just used a couple of well-seasoned cookie sheets. They came out perfectly. The only change I MIGHT make next time is to add espresso powder to intensify the chocolate even more – if that’s possible :). Thank you for the recipe!! so glad you enjoyed these! love the idea to add espresso powder! I made these the other day and something seemed “off” with the flavor. Couldn’t quite put my finger on it. How dramatically would the flavor change if I used 3/4C brown sugar and 3/4C regular sugar? I think I might try that for the next batch. I must disclaim that I’ve never had the real deal so I really have nothing to compare these to! Also, I love the idea above about adding espresso powder! Nice! changing around the sugars would change the flavor some, but it would also impact the texture of the cookies as brown sugar helps keeps the cookies moist and soft. These taste like heaven, but my much younger sister just called them “poppies” and my husband commented “these are like eating the Cookie monster’s dumps”. They do look a bit …. !!! Seriously delicious though. Lol! I’m glad you like how they taste. I’m surprised to hear you say that. dutch processed cocoa powder is more of a specialty one. but non dutch processed is usually sold in the baking aisle of most grocery stores. For example, hershey’s and ghiradelli carry regular rich cocoa powder that has not been dutch processed. I’d also recommend Amazon. I buy a lot of my baking supplies from there. I can get Hershey Unsweeted Cocoa; which is not dutch and Hershey Dark which is dutch. Hmm, how about ghiradelli? I believe they have a premium cocoa powder that is not dutch processed. or you can use the non-dark one if you’re okay with the cookies not have a dark chocolate flavor or appearance. Just made these, and they turned out awesome! Will gift to a friend for her birthday : ) Thanks for sharing! I’m so glad they turned out well for you. I hope your friend loves them too! These came out so great! I had to adjust my oven temp to 350 for 8 minutes though my first batch were hockey pucks ? I’m glad you got them to work! I’m surprised your first batch came out burned. I wonder if maybe your oven runs hot? Or did you make the cookies smaller? Mine are still barely baked at 10-11 minutes because they are so big. can you convert the cup of butter to weight in grams? and also cup chocolate? Had trouble mixing up the cold butter with my basic handheld mixer. Had to wait for it to soften on it’s own since it wouldn’t mix up as (very) cold cubes. I also eye-balled the chocolate chips I added which was a very silly thing to do- I probably added a cup. Very good cookies, but mine needed more chocolate chips/chunks! Mine were not gooey in the center, but that’s because I made 15 decent sized cookies instead of 8 huge cookies, but still baked them for 10 minutes. Will make again! Thanks for the recipe! I’m glad they worked out for you. I think you’ll find them to be more gooey if you make them as the huge cookies. I also think you’ll find the choc chips to be enough if you measure them out. Made these tonight and they are THE BEAT COOKIES I’VE EVER MADE IN MY 41 years of life. Not kidding. Can’t wait to make the regular chocolate chip cookies next! Your comment just made my morning! thank you for taking the time to leave such a nice comment. I never leave comments, but this recipe is too amazing to not say something. I have made a lot of cookies,and these are the best I have ever had. They are even better the next day. They are too easy to make! I’ve made them once a week for the last 3 weeks. Thanks for sharing! your comment made my evening! thank you so much for taking the time to write it and I’m so glad you liked these cookies! OMG thank you so much for sharing this recipe!!! There are not enough words to describe how amazingly delicious these cookies are!! I will absolutely be making these again! aww, I’m so glad you liked them!! I am eager to try this recipe. No vanilla in this recipe? no vanilla. You can feel free to add it but I was aiming for rich chocolate, so I didn’t want the vanilla to take away from that. I do use vanilla in my regular chocolate chip recipe version. Thank you for your wonderful recipe. They taste amazing. Unfortunately mine spread way too much even though I refrigerated them for over 1 hour. Any further advice would be most welcome. Will it be ok if I put the dough in the freezer and then bake the,m in batches?? Any chance you have experimented with a Gluten Free Option??? Thanks! Thank you! This turned out very well for me. I only changed the sugar as I only have light brown sugar available.. Before this I was following a recipe that spread too much so I was a bit worried about this one too but it turned out great! I’m very happy you enjoy this recipe! 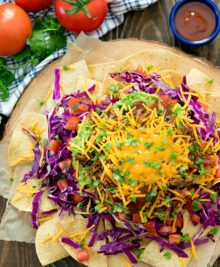 I originally tried this same recipe when I saw it on modern honey (but with PB chips), and it was delicious. I wanted to compare it to other levian knock off chocolate cookies and made your recipe, not realizing it’s the same one. This batch came out with a sticky loose batter and very cakey, like a cupcake. Total flop 🙁 no idea what I did wrong since it’s pretty straight forward and they came out great the first time, but given that a few other people have had cakey cookies or too much spreading, it seems that there’s weird hidden room for error. I halved the recipe, though that shouldn’t be an issue. In any case I can attest to this being a hit when made right from my first batch! WARNING!!!! Do not try to make one large mega cookie! I thought it would be a good laugh at first – but then, I opened up the oven. A cloud of black smoke came pouring out, and a nasty smell filled my kitchen. The cookie had been burnt to a crisp!!! It was burnt so badly that even the parchment paper turned black!!!! I would recommend NOT making large mega cookies, and sticking to only medium or small mega cookies. The cookies are amazing! I didn’t make mega cookies. I portioned them out to 1.5 ounces before adding the extra chips. I made them as an experiment to see if people would like them. I have been asked to make them for the holidays for all of the gatherings that I will be attending. Thank you for the recipe. So glad you enjoyed the recipe! Has anyone baked then frozen them? How did they turn out? I’m glad they still turned out well!